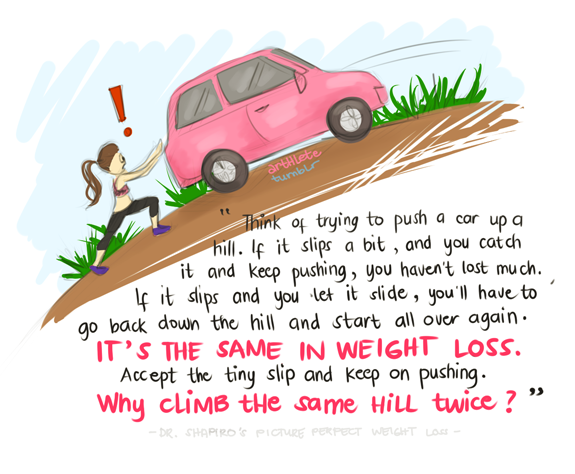 Do you have weight loss goals that are currently being threatened by all that is the holidays? No doubt we all do, what with the cookies and the parties and the drinks, etc...just remember—accept tiny slips . You can always redeem yourself, and it's much easier than falling back to your beginning (whatever it may be). I've said it before and I'll say it again (and again): You're human. Slips happen. Learn from them and keep pushing forward, up and on. Question: Do you follow me on Pinterest yet? Do so for a sneak peek at upcoming Pinspiration Thursdays! 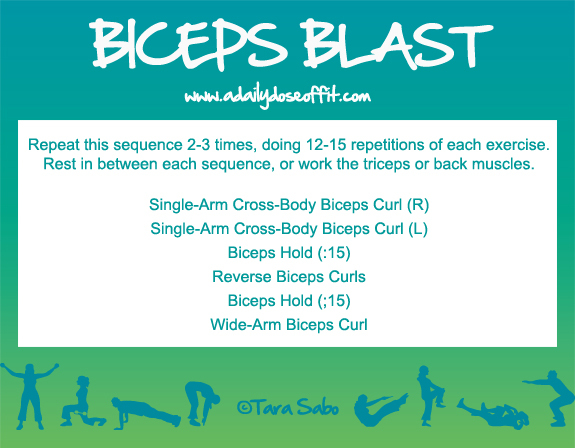 I thought I'd go out on a limb here and give you a biceps workout. (Get it? "Go out on a limb...") That's not to say you should only work your biceps on any given day, but I thought what follows might be something fresh for you on back/biceps or upper body (maybe even total body) days. Remember to choose a weight that challenges you in the back half of your repetitions. Meaning, you should feel a slow increase in the resulting burn. If you don't have weights, you can use an exercise band. Although it won't work for the hold...try a body bar or weight plate. Or maybe a bag full of books! In terms of form, always keep your elbows below your shoulders, and don't let your shoulders move too much...you want to use your biceps, not your shoulders, to move the weight in your hands. And once you've got that in check, check your lower back for any excessive arching. If you have to lean back at all to lift your weights, then the weights are probably too heavy. Curl the weight up and toward your heart before lowering it again. The unused arm can relax at your side sans weight. This type of exercise targets the outer portion of your biceps muscle. With weights in both hand, bend the arms to 90 degrees with your palms facing the ceiling. Hold for 15 seconds. This is a standard up-down biceps curl, but your palms face the ground. This is also a standard up-down biceps curl, but your hands are turned out to the side. This type of exercise targets the inner portion of your biceps muscle. Try it and let me now what you think. I don't know about you, but I've always enjoyed working my biceps. Especially at this time of year. Sure, they're hidden beneath sweaters and coats and turtlenecks—that just makes them my little secret. My little reminder that hard work pays off. Speaking of hard work, today was a Spinning day. I still haven't taught a class on my own, but I don't have a class of my own yet. I'm at the top of the sub list, but I haven't claimed any open classes yet. I attribute this to A) not having the actual Spinning certificate in my hand, B) not having any cycling shoes yet and C) nerves. Yeah, I'm a little nervous about jumping in the instructor's saddle. I just need to do it. I felt the same way right before I took on my 6AM class, which is definitely going well. Has been for awhile now. So why don't I have the certificate yet? The spinning program is hands-on. Teach, learn, take the test...etc. And I realize that you don't need shoes to ride successfully, so that's just a silly reason for me to avoid teaching. And maybe just a cover-up for #3. Salad in a jar. Over chopped chicken and avocado. Best prep-ahead meal ever. 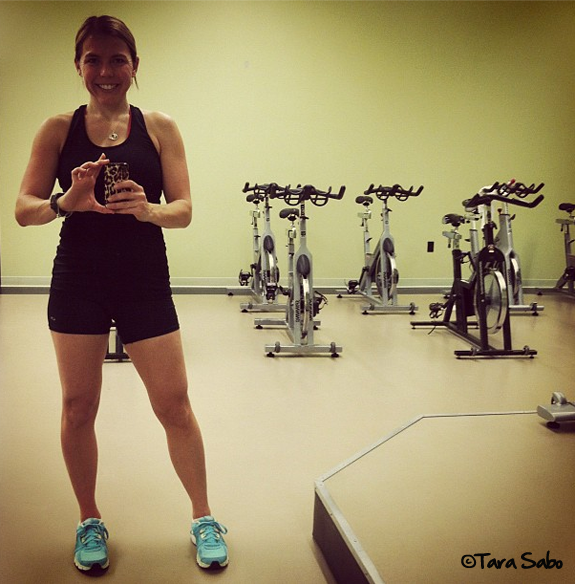 Question: What fitness classes and/or events/situations intimidate you? Did you rise above the intimidation factor? If so, how? Are you guys sick of turkey and stuffing yet? Did you have your fill of it on Thursday, or did you save some for later. In my case—both. I ate a healthy dose of all the goods on Thursday, and we had tons of everything left over. And I got sort of sick of it all by Sunday, but I'm not one to let food go to waste. So I decided to repurpose it in the form of a panini. A raspberry and brie turkey panini. So good, and so totally inspired by an appetizer that we forgot to make this weekend. Well, perhaps we didn't forget to make it—perhaps we were just too full to make it. Baked brie with fruit preserves? Ever have it? So sinfully awesome, delicious and filling. I think it's my favorite appetizer, actually. But since we never made it, I never got the chance to suppress my craving. Hence, my inspiration for the above. I'd give you a recipe, but there really is no need. Layer up fresh Brie with leftover turkey, low-sugar raspberry preserves and some spinach. Toast and eat. Question: What's your favorite way to repurpose Thanksgiving leftovers? Well, they are here. The holidays. And up first, we have Thanksgiving. Perhaps you've traveled to family afar or maybe you've stayed put. We're at my parents' this year, where plenty of family will soon gather for what will prove to be a loud, crazy and fun time. So in the spirit of things—I can already taste the stuffing (in fact, I did just get a preview sampling of it)—I thought I'd share this infographic. At the very least, it'll give you some awesome Thanksgiving stats to shout out across the dinner table tomorrow. Who's the smart family member? You are, my friend! Question: What random tradition or food not normally associated with Thanksgiving does your family have? Well, it's official. The holidays are here. In just a few days, a vast majority of us will gather around a table bursting with food and we'll pile up our plates in celebration of all that we are thankful for. And in the back of our heads, at some point or another, we'll freak out about that very plate full of food. We're human, it happens. But that's okay. The holidays come once a year and they don't have to wreck all that you've done to live a fit life thus far. 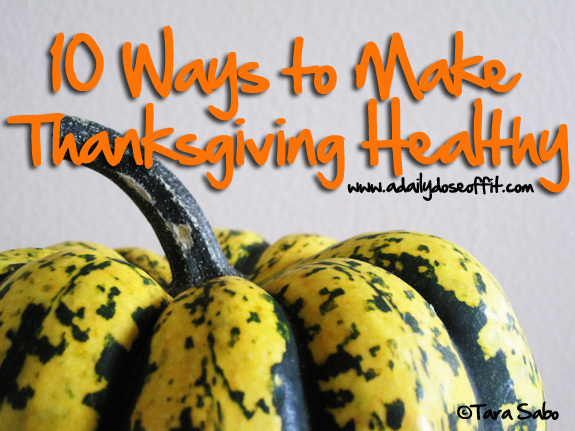 As proof, let's review some of the ways you can make the holidays healthy, particularly Thanksgiving as it's this week. 1) Participate in a fitness event with a holiday theme. Turkey Trot, anyone? Recruit your relatives to join in the fun. Winner gets to opt out of doing the dishes after dinner. Or put the wishbone up for grabs. 2) Offer to contribute something to the menu, be it an appetizer or a main dish, and make it healthy. Even the classics like stuffing and green bean casserole can be made with the best of ingredients and the healthiest of intentions. And if you're the cook, cook it clean. Fresh is best and often quite delicious. 3) Indulge in your favorite "naughty" treat. Otherwise, you'll just obsess about avoiding it. And by "indulge," I do mean with portion control in mind. 4) Drink if you must. But keep the water flowing, too. For every glass of wine or bottle of beer, chug a wine glass or beer bottle full of water. Rinse them out first, of course. 5) Fill a plate. Walk away. Eat, and be done. Pretend that "seconds" don't exist. 6) Don't "wait for dinner" to eat for the first time. You'll be way too hungry to eat clearly. Have breakfast and lunch, treat your holiday dinner like any other. 7) Pack your workout gear—and use it! Who wants to lug something for no reason at all? And let's be honest, if you go for a nice run the day of a delicious family meal, that nice run'll be fresh in your mind as you build your plate. Right? 8) If you're visiting family for the weekend, check out their gym. Attend your aunt or cousin's favorite fitness class. 9) Power walk post-dinner with your favorite family members. It's the best way to catch up on all the family drama—or to help the kiddos and cousins burn off the energy such a grand meal will surely provide. 10) Forget about being unhealthy. If you eat too much of something or consume one too many glasses of wine or decide not to go for that run in the morning, so be it. It's a holiday and you're human. You can pick up right where you left off the second you realize that you've gone astray. Or, you can wait until the next day. Question: How you do plan on keeping the holidays healthy this year? I really should just call this post "6 Things That Make Me Happy" because today is Friday. And let's be honest, Friday always makes me happy. But since that's sort of a given, we'll go with just 5 things that make me happy. And just so we're clear, these aren't the only five things that make me happy. Did you know that November is National Pomegranate Month? I had no clue, but oddly enough, I had two pomegranates in my fruit/produce bowl that I finally managed to cut into last night. If you don't eat pomegranates...seriously, why? They're so good and SO GOOD for you. Say it with me: Antioxidants are awesome! If you don't eat them because they're a pain in the rear to de-seed, well, I don't blame you because they are. But not really. You just have to cut them in a big bowl of cold water. You won't stain anything with the juice and the gook will separate from the seeds because the seeds sink. It's so worth it. I promise. 3) Gym equipment for babies and tots. I still haven't tried a CrossFit workout, but that doesn't mean I don't appreciate the equipment commonly featured in a WOD. Honestly, I use the same equipment all the time, just not in WOD format. So this stuff in the video...anything in miniature form is adorable, so workout toys for kiddos...straight to my heart. I'll have to get some WOD toys for Hannah someday. You guys, I'm so stoked. We finally got a set of kettlebells at the gym and I'm slated to teach a 30-minute kettlebell workout on Tuesday mornings. 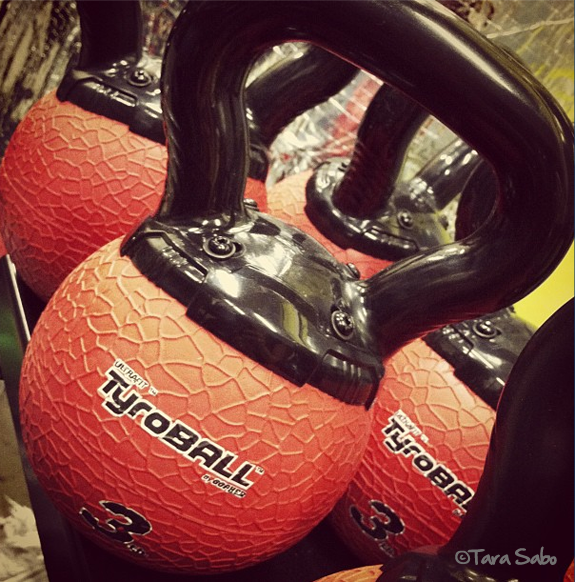 I've played with kettlebells before, but it's been awhile so I need to refresh. We also got hula hoops, but that's on someone else's schedule. Seriously, the hoops are huge. I couldn't manage them. Question: Have you ever taken a hula hoop class? What did you think? If you could add any piece of equipment or class type to your gym or home gym, what would you add? Didja think I forgot that it's also Pinspiration Thursday up in these parts? Nope. Whether you're pushing through plateaus in the gym or rising above personal controversy, you must turn these things into strengths both physical and mental. Trust me, it's possible. And so worth it. Now, go. Prove to the world that you're a Greatist. Follow me on Twitter, join in the conversation and use #imagreatist whenever you do something that makes you great and wonderful (and healthy and fit, etc.). 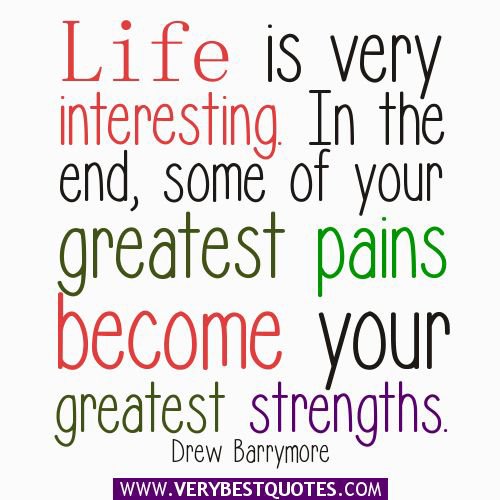 Question: What have you done lately that made you want to shout "I am great!" to anyone willing to listen? We talked about belly breathing yesterday, and today I'd like to talk about core strength. Far too often, I get asked how many crunches one needs to do in order to get that coveted six pack. First and foremost, I respond by saying that a six-pack is not made in the gym. It's not made by spot-training your abs to death. You have to combine a good diet with cardio and strength training to achieve that which so many of us want. And by strength training, I do mean that you have to perform some core exercises. You can't completely avoid them. But you can, if you want to, avoid crunches. 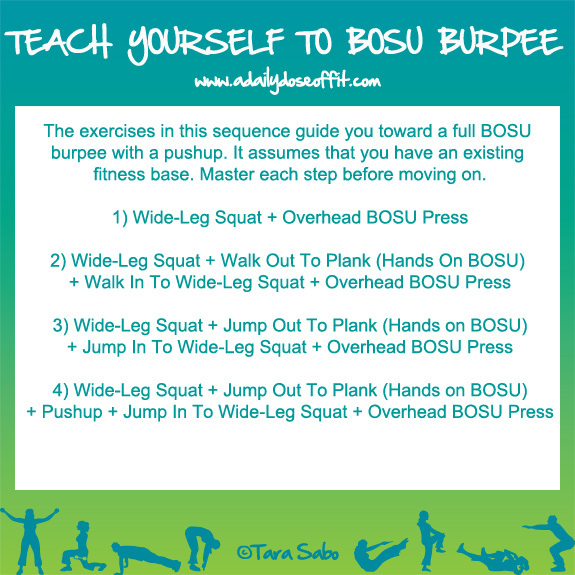 Try and move from one exercise to the next. Don't rush, keep every move nice and smooth and remember to breathe deep. Pause between each go-through. In a traditional down dog pose, extend your right leg and then tuck it into your chest while moving from down dog to plank position. Extend the leg, bringing yourself back into down dog split. Repeat. Lie flat on your back, arms extended above your head to create one long line with your body. Legs should be straight. Contract your abs, keeping your elbows by your ears as you roll up to a seated position, proceeding to roll forward toward your toes before lying back down again one vertebrae at a time. This move, especially, needs to be slow and controlled. This workout can be done alone on cardio days or in addition to upper body, leg or total-body days. Please modify if you need to—contact me if you need modifications. I'd be happy to suggest alternatives. And, as always, please check with your doctor before beginning any new or rigorous activity. One last thing—remember that it's really not about getting a six pack. Strive instead for a core that's strong and supportive because your core, after all, is the center of all that your body does. As cheesy as it sounds, it's what on the inside that counts. 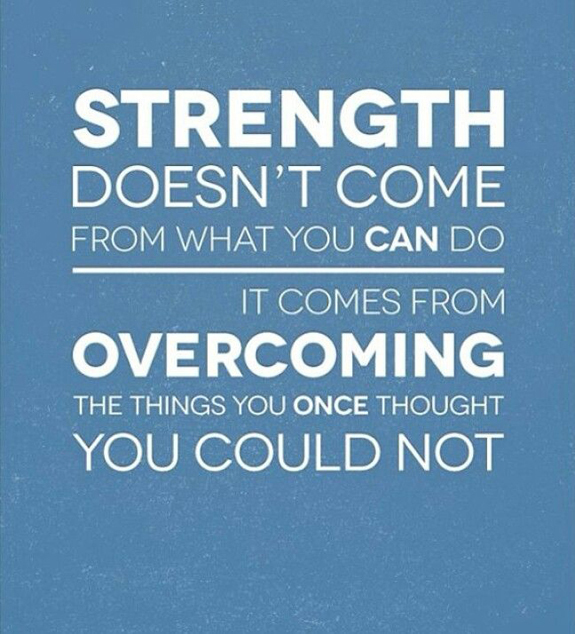 And that's where you'll find your strength. Inside. Literally...and also figuratively. Questions: Do you add crunches to your core workout? What is your favorite non-crunch core exercise? I finally worked my way through Tara Stiles' 60-Minute Strong Flow, which is on Disc One of her This Is Yoga DVD series. After a strenuous Circuit Sculpt yesterday morning, I felt pretty sore when I woke up today so I thought some yoga would help me loosen up—which it did. Partially because of the pose flow, partially because of the belly breathing. Why is belly breathing so important? It's the most efficient way to send oxygen soaring through your body. Belly breathing, otherwise known as "diaphragmatic breathing" or "deep breathing", pulls a ton of air into your lungs and pushes a ton of carbon dioxide out. Good stuff in, bad stuff out. It's that easy—except it isn't. Belly breathing is something that doesn't always come naturally, especially when you are exercising. The harder you work, the easier it is to rely on short, quick breaths that come from the chest rather than the abdomen. This hinders your intake of oxygen and, consequently, the quality of your workout. Do this with me for a second: Place one hand on your chest and one hand on your abdomen to check for belly breathing. If you're doing it, the hand on your abdomen will rise and fall. If it isn't, start taking slow and deep breaths in through your nose and exhale out through your mouth. Not only will this transition you to belly breathing, you might also notice it introduce a sense of calm to your state of being. When we tense up, get stressed or angry, we tend to forgo belly breathing. But a return to it can almost instantly calm you down. Question: How mindful are you of your breath? Do you do breathing exercises outside of yoga? Do you meditate? I am always in awe of people that do. I don't think I have the patience for it. How do you eat a persimmon?! I guess it could have been the Batman socks, too, which you cannot see in the picture. Yeah, I wear Batman socks. So what. They were on sale this week, and the sign said they were sweet, so I thought maybe I could give them to Hannah...but it wasn't exactly soft when I cut into it. I thought it might be like a plum or a peach, but it was closer to an apple. Perhaps it wasn't ripe? It smelled good when I cut into it, and I read that it's okay to eat them when they're firm. And it did taste good. But I ate it with such caution...do you ever eat new things like that?! Like, you know it tastes good, but you don't want to trust it quite yet?! So help me. Help me like persimmons. They're filled with fiber and that's a good thing. Question: Do you eat persimmons? Do you eat them raw? Do you have an awesome persimmon recipe that you should share with me?! I popped in the first disc for some Strong Flow yesterday and it was awesome. Granted, I only got through about half of the 60-minute class because Hannah woke up, but I did make it through—and successfully held—the headstand part. Love me some headstands. I'm sure you'll hear more from me about these DVDs as I check out each of the above sessions. And speaking of checking things out. I'm all set to check out my first blog conference next year. Yeah, I have to wait until next year, but i wanted to take advantage of the discounted ticket prices. I'm going to BlogHer 2013. It's in Chicago. I couldn't pass up the opportunity since it's pretty much happening in my backyard, but as of right now, I'm going alone. So if you're a blogger and you're going, talk to me. If you're a brand and you'll be there, talk to me. I'll need some friends there. And just like that, it's Friday. Doing anything fun? Question: What is your favorite workout DVD? Respond to the above how you will, but in my humble opinion, I think it's a friendly reminder to work outside of your comfort zone. To push yourself safely beyond levels where you've already found success. If you can curl ten pounds for hours, that's great, but you'll get much more out of your workout if you work up to those twelve pound weights. From a different perspective, I think you can deduce that strength, be it physical or emotional strength, comes with believing in yourself. If you tell yourself "no," sell yourself short, or hold yourself back from doing that which you want to do...well, it's like a permanent stop sign on the road your life is on. Why do that to yourself? Stand tall. And in standing tall, you'll find new aspects of yourself, new levels of strength, that you might not known to have been there. So...go. Find joy in your abilities. Forget about that which you're used to and remind yourself that there is more to this world...more to you...than you can possibly imagine. Move forward with eyes wide open. With the believe that life is yours for the taking. That's how you grow. That's how you get stronger. That's how you continue to write the book of you. Two very large butternut squashes have been sitting on my counter for quite some time now. Not because I've been too lazy to use them, it's just that they produce a lot of food...and the two used to be three, and we only recently finished up the remains of the first one I roasted. But it's that time of year. Time for squash and time for soup. So I made an easy, healthy butternut squash soup with three ingredients. Well, five ingredients if you count the salt, pepper and olive oil. Which I don't because you don't even have to measure them. Let me back up for a second. I love soup, but it has to be super thick or broth-based. Nothing in between for me. So unless I'm making black bean soup, the soups I make are typically of the broth-based variety because I don't like cream in my soup. And for some reason, all the recipes I find for super thick soups call for cream. So when I went on a hunt for a butternut squash soup recipe, I had two criteria: Easy and cream-free. If I could find a recipe that meshed with these demands, then I'd be a happy eater—I'd also be able to share the results with my daughter, who loves butternut squash but cannot yet consume cream. (The husband doesn't like butternut squash, crazy fool.) And based on the photo above (and if you follow me on Instagram), you know that I had great success. 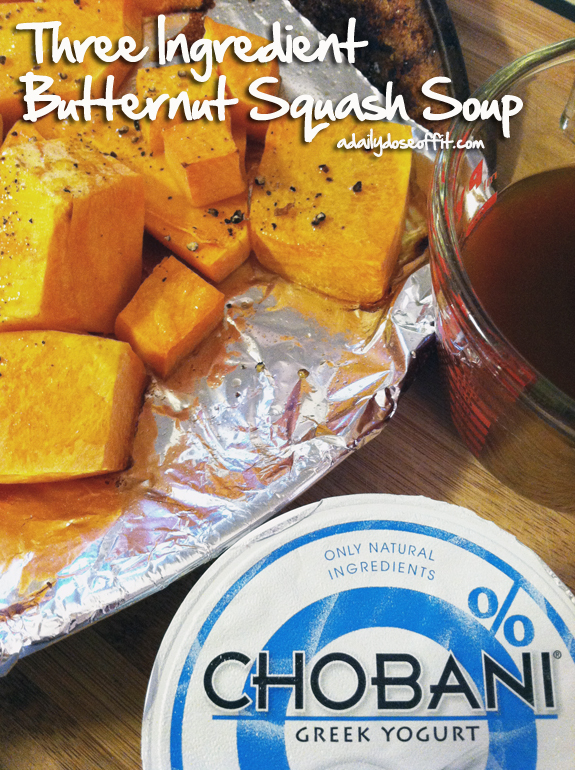 Easy, healthy butternut squash soup with just three ingredients. A bowl for me, a bowl for my daughter—and plenty of leftovers in the 'fridge. Trust me, this soup is thick and delicious. And so easy to make. Here's the recipe...note that you can add more vegetable broth if it's too thick for you. 2) Peel the squash, cut it in half and remove all seeds and guts. Dice the good stuff and place it on a lined baking sheet. Brush it with a bit of olive oil. Sprinkle it with salt and pepper as desired. Roast until soft. 3) Once cooked, add half to a blender with half the yogurt and half the vegetable broth. Process until smooth, then pour it in a stockpot on the stove. Repeat, then heat until warm—no need to bring it to a boil! 4) Top with toasted walnuts if desired, served with sliced toast or a nice salad. Question: How do you like your soup? What is your favorite kind of soup? 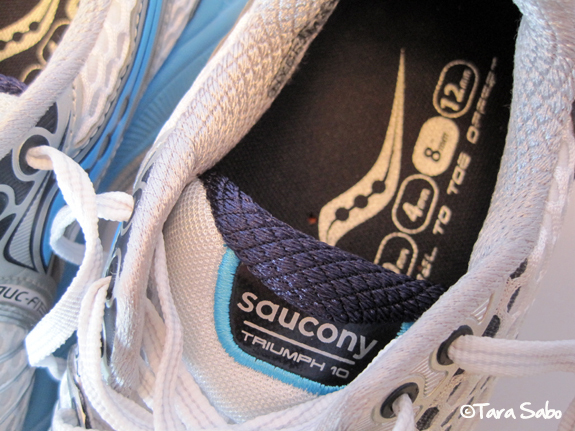 As a FitFluential Ambassador, I was recently given the opportunity to try out the new Saucony Triumph 10 running shoes. I'm typically a Nike girl, and had just purchased a new pair to use while training for the Hot Chocolate 15K, but I wasn't about to turn down a pair of Saucony running shoes. I've heard great things, to say the least. And I'm not necessarily a one-brand girl, so I laced up with an open mind. Without the laces looped through that hole, the shoes felt really loose around the ankle. The rest of my foot, however, felt snug as a bug. According to the Saucony website, "breathable open mesh and supportive underlays provide a clean, modern look while securing the foot to the platform." This great fit combined with Saucony's PowerGrid midsole technology to really give my feet a nice, comfortable ride. Speaking of comfort, I tend to have problems with shoes because I have bunions. The bump on the inside of my big toes often gets squished in shoes, making for some major discomfort. But I had plenty of room in these shoes. I honestly felt like the front of the shoe was a bit wide, actually—but I think that's because of the "deeper flex grooves" built into the soles of the shoes. And when they say "flex," they really do mean that the Triumph 10s are flexible. I definitely felt like the shoes promoted a smooth transition from heel to toe. Then again, "The redesigned crashpad features three fully-decoupled, independently responsive pods for a smooth landing and efficient transition." But the heel-to-toe transition isn't the only one worth noting. If you're a Saucony fan, you might already know that this isn't the first Triumph 10 running shoe. It is, however, an updated version. They're lighter, have a new crashpad and (going back to that "snug as a bug" feeling) feature a new ComfortLite sockliner that hugs your foot for added support (particularly around the arch of your foot). Oh, AND. They come in some pretty sweet colors. To conclude, I think it's safe to say that the Saucony Triumph 10 running shoe will be a big part of my running game moving forward. As a neutral runner, the foot support was great from start to finish. I was extremely comfortable during long and short runs, never once getting a blister. Or a cramp. I still like my Nikes, but I notice a difference in support when I switch between the two. So I think I'll save the Nikes for shorter runs and bust out these Saucony Triumph 10s whenever I go the distance. That way, they'll last even longer. 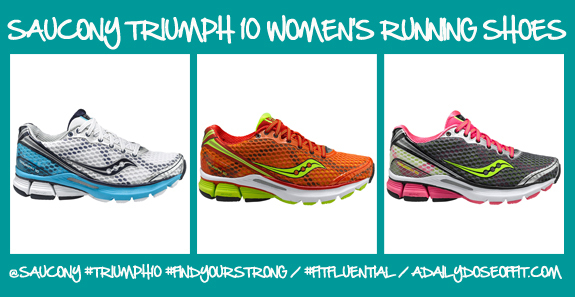 Visit saucony.com for more information about the Triumph 10 running shoes. To stay in-the-know about all things Saucony, follow them on Facebook, Twitter, YouTube and Pinterest. 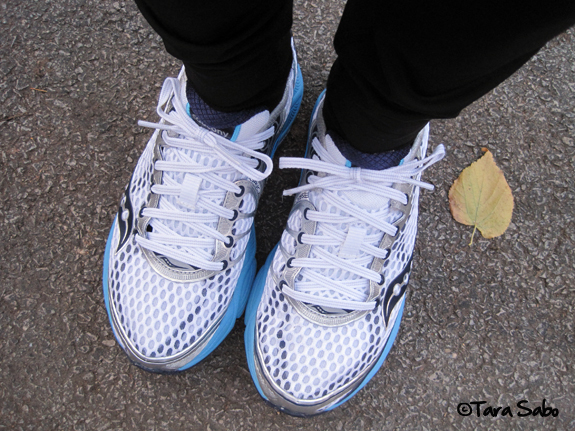 Question: How many pairs of running shoes do you have in your rotation? Do you run in Saucony shoes, and if so, which model? 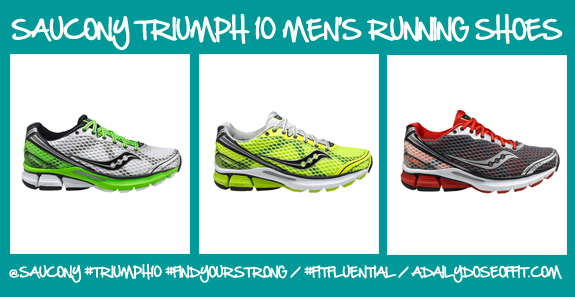 Note: I received a free pair of Saucony Triumph 10 running shoes from Saucony via FitFluential, Inc. I was not compensated for this review in any additional way. All opinions are my own. Such a weekend! We left for Chicago on Saturday morning and I couldn't have been more excited to take my girl into the city for the first time. Last time she was there, she was protected from the wind and cold and sights and sounds—I was about eight months pregnant. So this time around, she got to experience everything for real. Including the shopping. And she was a total trooper. (Pretty sure she likes the city, just like her mom.) But it wasn't all about the awesomeness that is Chicago. I was there to run, and run I did. 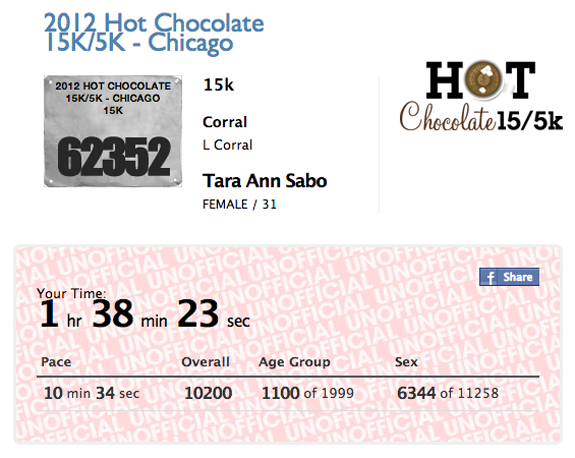 I heard some pretty great, also some not-so-great things about the Hot Chocolate 15K/5K in Chicago. Everything from disorganization at packet pick-up to crowds of people to awful and awesome routes, but the fact that it was all built around chocolate and the consumption of it had me sold from the get-go, so I was super excited for race day. Especially since I felt really ready for it after all the training. I ran in the new Saucony Triumph 10 running shoes. They did me good, but can you tell they are new? They're, like...so bright compared to my black pants. Ha! I think I'm still a Nike girl at heart, but I'll definitely keep the above in the rotation. I'll post an official product review tomorrow. Today, I'd like to keep talking about the race. She's six months pregnant, and did an awesome job. The three of us together where part of the 40,000-plus that ran it. That's a lot of people, but I never once felt like the route was crowded. And the race itself started in a timely fashion. Question: What's the best post-race/race-day swag you've ever been given? Have you guys heard of PokitDok? It's an online community that empowers people to take control of their own health and wellness by simply connecting them to other individuals with similar experiences and credible resources. It's great, really, and I'll be partnering with them over the next few weeks on a series of blog posts. 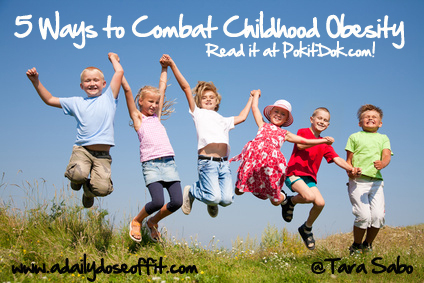 The first of which discusses "five ways to combat childhood obesity." It's a topic that hits close to home these days as my little bundle of joy is exploring new foods and getting more and more active. A pattern I hope she continues for a very long time. So head on over to PokitDok and check out my first post. And if you feel so inclined, connect with them on Facebook and Twitter, too. Show 'em some love, eh?! I never know which one to eat first. I know I'm savin' the Plain for Hannah. She loves it with some mashed bananas. She loves it, but also makes the funniest of faces when she eats it. Like, "this is kinda weird mom...kinda sour-tasting, but I love it still." I know she loves it because she kicks her feet like mad, which is a sure sign she's ready for more. Training update: I ran an easy three miles in my new Saucony Triumph 10 shoes. We'll see how they do in this weekend's 9-miler in Chicago. Do you know that I haven't been to Chicago in just about a year?! I cannot even believe it myself. I cannot even begin to describe to you how excited I am to go back, even though it's for a short weekend. I'll take any time in the city, for real. Question: Have you ever been to Chicago? What's your favorite thing/place/store in the city?